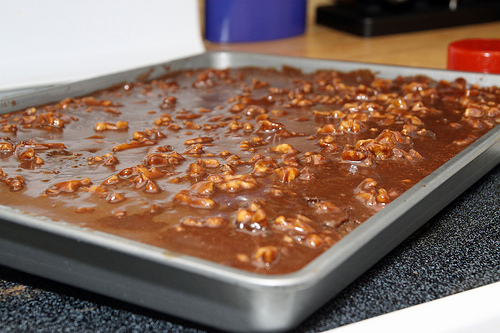 This Texas Sheet Cake is a family tradition, we grew up eating it. I’ve had many Texas Sheet Cakes or Texas Chocolate Cakes or Chocolate Sheet cakes, as everyone in my home state of Texas has their own version of it. This is hands down the best one that I’ve ever eaten and everyone falls instantly in love with it. It’s quite addictive, you can’t eat just one bite, trust me… you keep going back for more. 1. Stir flour (I use a little less than 2 full cups), sugar, salt. 2. In sauce pan put margarine, cocoa and water. Stir while bringing to a boil. Pour over the flour mixture. 3. Stir eggs, soda, buttermilk, cinnamon and vanilla together. Add to the flour/cocoa mixture. 4. 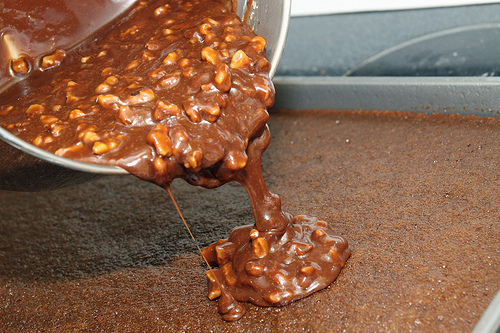 Bake in greased sheet cake (10×15) pan for 18 minutes on 350. 5. Minutes before cake is done make the icing. 1. Mix together; cocoa, margarine and milk. Heat and then add nuts, powdered sugar, cinnamon and vanilla. 2. Pour over hot cake and allow to cool. **** The original recipe calls for Oleo, but you may use butter instead of margarine. If you use salted butter, omit the salt from the recipe. *** The sheet cake pan for this recipe is a 10X15 sheet cake pan – you may know it as a jelly roll pan. Absolutely! Let me know if you try it.